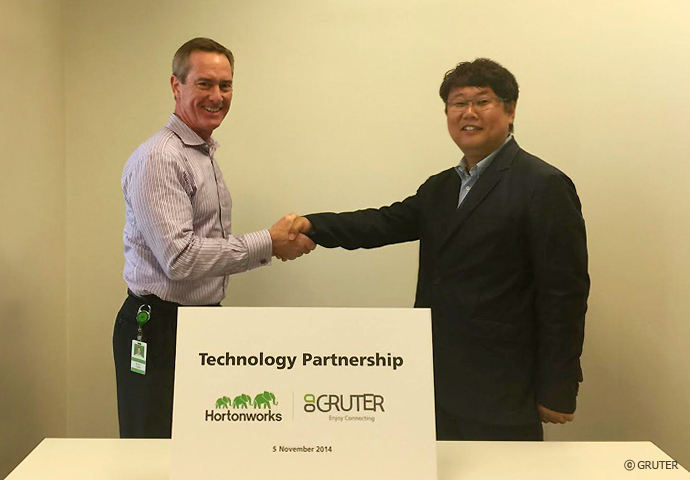 Palo Alto, Jan. 20, 2015—Gruter, a big data company which builds next-generation data warehouse systems, today announced that it has joined the Hortonworks® Technology Partner Program. Gruter’s new partnership with Hortonworks, the leading distributor of Apache™ Hadoop®, will enable users of the Hortonworks Data Platform (HDP) to more readily integrate their systems with Apache Tajo™, significantly closing the performance gap between big data infrastructure and more traditional data offerings. Hortonworks President, Herb Cunitz, and Gruter CEO, Youngkil Kwon, at the formal signing of the new partnership between the two companies. Popularly classed as an “SQL-on-Hadoop” solution, Apache Tajo has positioned itself as a powerful, cost-effective alternative to traditional data warehouse infrastructure. Optimized for running interactive queries and complex ETL jobs on massive data sets, Apache Tajo brings extensive native SQL support and advanced database query techniques to the big data processing challenge. “With our new offices in Palo Alto, our partnership with Hortonworks positions us to take our technology to the global enterprise marketplace,” said Youngkil Kwon, Gruter CEO. HDP is built by the core architects, builders and operators of Apache Hadoop and includes all of the necessary components to manage clusters at scale and extract intelligence from big data. The Hortonworks Data Platform (HDP) has a YARN-based architecture, enabling multiple workloads, applications and processing engines to operate across single clusters with optimal efficiency. A reliable, secure and multi-use enterprise data platform, HDP is a central component of modern data processing architectures. This entry was posted in Media, News, Our Story on January 21, 2015 by enblog.